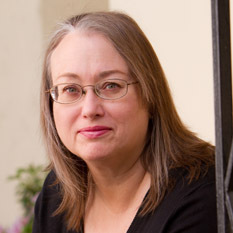 Catching up on my blog reading today, I turned to "Cosmic Log," science writer Alan Boyle's must-read column on msnbc.com. Today's entry is titled "Stephen Hawking's curios explained." To celebrate Hawking's 70th birthday, the Science Museum in London is displaying the keepsakes he displays in his office and Alan reported on some of the individual objects and what they mean to Hawking. Scrolling down the page, I stopped at the third still image when I noticed a glass model of the planet Saturn that looked awfully familiar. "Donna!" I yelled across the room to Donna Stevens, the keeper of all things artistic at The Planetary Society. "Look at this! Is it what I think it is?" "OMG! It's our Cosmos Award!" Donna was excited. "I'll have to tell the artists who made it." And she ran to her computer to send them an e-mail. "Bill, come here!" I yelled again, this time to Bill Nye, who sits in the office next to mine. "You have to see this." "Look at that," Bill said, bending over my computer screen. "I think I've seen that planet somewhere before. 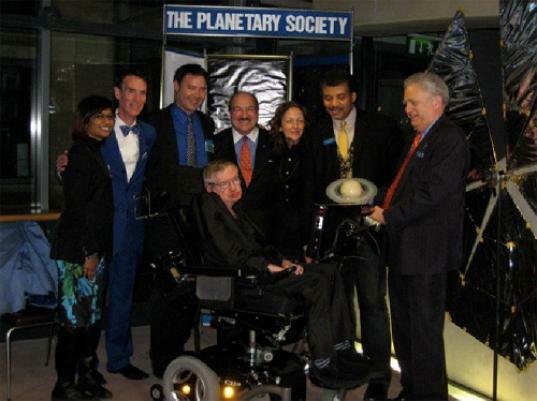 Like, when we presented the Cosmos Award to Stephen in Cambridge. It was almost two years ago." Mat Kaplan, our Media Producer, looked over Bill's shoulder at the image on my computer screen. A quiet sort of person, Mat simply said, "Wow!" The glass model of Saturn represents the Cosmos Award for Public Presentation of Science, given by The Planetary Society to those who best exemplify the standards set by the Society's co-founder, Carl Sagan, and his landmark television series, "Cosmos." In honor of his many engagingly written science books and imaginative television programs, the 2010 Cosmos Award went to Stephen Hawking. We are honored and touched that The Planetary Society's Cosmos Award is now on display at the Science Museum in London as one of Stephen Hawking's favorite things. B.E. Johnson and Joy Day are the artists who created the glass Saturn in the award. Rick Sternbach produced the fine wooden base. Here's a link and picture of the 2010 Cosmos Award presentation. And here's a link to Alan Boyle's always-informative blog. A grant from the M.R. & Evelyn Hudson Foundation makes possible The Planetary Society's Cosmos Award for Outstanding Public Presentation of Science and that has been awarded to date to James Cameron, Paula Apsell and Stephen Hawking.